The style of Jujutsu (gentle art) taught at Idokan Australia is Rishin Ryu Jujutsu (The school of right action). This style was named by Tesshin Hamada, Hanshi. Vice President of the Dai Nippon Butoku Kai of Kyoto/Japan in 2009. The founder of Rishin Ryu Jujutsu is Kevin Walsh. 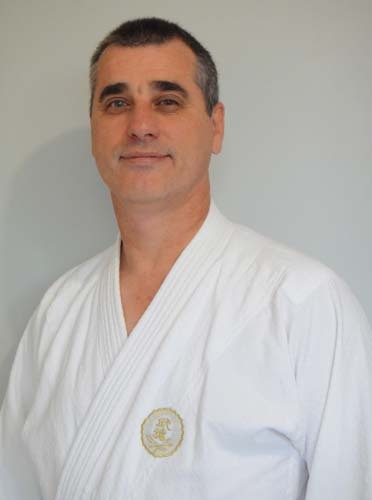 The development of Rishin Ryu Jujutsu was greatly influenced by the tuition from Shihan Wally Strauss, Shihan Barry Bradshaw, the classical Jujutsu training from the DNBK Honbu Sensei in Kyoto/Japan and the many seminars Kevin attended and taught at around the world. Also sharing this journey is his wife, Leanne and good friend Wendy Carroll (deceased). Their impact and direct influence on the development of Rishin Ryu Jujutsu should not be underestimated. They helped temper and shape Rishin Ryu Jujutsu into what it is today. Jujutsu is one of the Bujutsu (Warring Art – Martial Art) developed by the Samurai of Japan on the battlefield from about 1533. The Samurai dedicated their life to perfecting their shills with the sword (Kenjutsu), spear (Sojutsu), archery (Kyujutsu) and unarmed combat (Jujutsu). When Japan aligned itself with the western cultures during a period called the Meiji Restoration (1868–1912) the practice of Jujutsu was frowned upon and almost disappeared. From the thousands of schools that existed before the Meiji period only a small fraction have survived to modern times. The study of traditional Jujutsu while fulfilling and interesting is difficult and not always practical for modern times. Japanese of old did not have chairs so many of the techniques taught are from the Seiza (kneeling) position. In old Japan the samurai spent a great deal of his time in Seiza without his sword so it was extremely important to learn defenses from this position. For most westerners kneeling for more than a few minutes can be agony. Japanese also wore Kimino (strong jacket) and Hakama (loose pants). Today’s society of T-Shirt and jeans is very different so you do not have the same strong jacket to grab. This is another reason for some of the Koryū (traditional) Jujutsu techniques are not so effective in modern times. Rishin Ryu Jujutsu uses many of the traditional Jujutsu techniques of the Samurai and applies them to the modern western world. This is comprised of two Kanji 理心. The first Kanji “Ri” means “rational” or “intelligent” and the second “Shin” means “heart” or “spirit”. Together they mean, “Making rational, intelligent decisions while being aware of your moral and social obligations”. The abbreviated meaning is “Right action”. Students of Rishin always try to apply the “Right action” to any given circumstance. “Right action” – this is to apply the right action to whatever problem/issue faces you. The right action can be difficult as the right action is not always the easiest path. However it is the path to being true to yourself. In martial art terms, “Right action” means to not fight “force with force” but rather “go with the flow” and launch a counter strike or apply a direct action, cutting through the attack.